According to the ornithologist Oliver Austin, two features shared by Aegithina, Chloropsis, and Irena are also typical of bulbuls (Pycnonotidae): the upper tail coverts are long and fluffy, and a patch of hair-like veinless feathers is present on the nape. All are excellent vocalists. Varying in length from 6 to 7 in (13-18 cm) and averaging half an ounce (13 g) in weight, the four iora species are quietly patterned in shades of yellow and dull green, with some black in the males. With the exception of the great iora (Aegithina lafresnayei), the wings are dark, with boldly contrasting white bars, in both males and females. They have pale gray eyes and thin, uncurved black beaks. Breeding males are generally dark and more brightly colored than females. 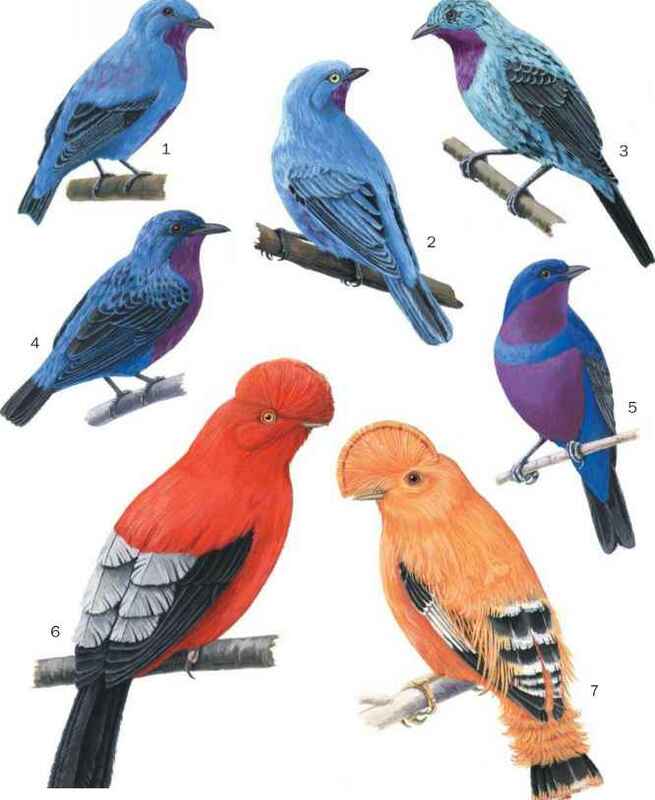 Unlike leafbirds or fairy bluebirds, nonbreeding male ioras have a comparatively dull eclipse plumage. size, and the tarsi are short and fairly strong. The beak is slender and slightly down-curved, and the tongue appears to be specialized for nectar feeding. The size range is 7-8 in (17-20 cm), and weights are 1-1.5 oz (25-40 g). The plumage of the male Irena puella can be described as a meeting of large fields of blue and velvet-black, accented by brilliant red eyes. 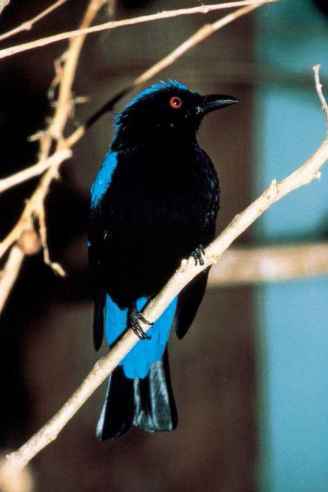 The female's feathers are largely greenish cobalt, with black primaries and bright blue elongate rump feathers, as well as an equally red eye. Both sexes of I. cyanogaster are patterned in a comparatively indistinct pattern of deep blue and black. The feet of both are remarkably small in proportion to the generally robust, thrush-like body. At roughly 10 in (25 cm), and 2.5 oz (75 g), the fairy bluebirds are by far the largest members of the Irenidae.